[FRANKLIN D. ROOSEVELT] [SUPREME COURT]. Signed Book. 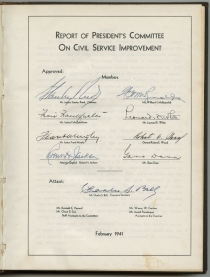 Report of President’s Committee on Civil Service Improvement. [Washington, D.C.],	February 1941. 8 x 10 ½ in., 278 pp. 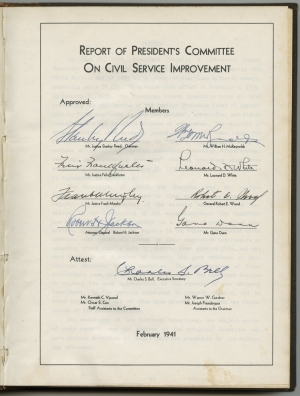 On June 24, 1938, President Roosevelt extended the Civil Service Act of 1883 to approximately 24,000 higher-level positions. While most positions were quickly reorganized within the Civil Service, roughly 5,000 positions required a more complex transition. Officially classified as professional, scientific, or otherwise specially-skilled jobs, most were attorney positions. 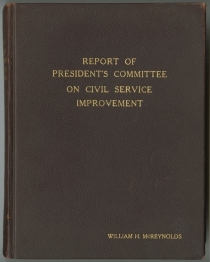 To facilitate the attorneys’ smooth shift into the Civil Service, Roosevelt issued a second order at the beginning of 1939 that postponed the application of the earlier order and created a special committee to “make a comprehensive study of methods of recruiting, testing, selecting, promoting, transferring, removing, and reinstating personnel.” The Committee on Civil Service Improvement, after several intensive meetings, produced this report, which offered extensive recommendations for integrating legal, engineering, architectural, natural science, administration, and social science positions into the Civil Service. Committee members included Supreme Court Justices Stanley Reed, Felix Frankfurter, and Frank Murphy; Attorney General (and future Justice) Robert H. Jackson; the President’s Administrative Assistant and Liaison Officer for Personnel Management William H. McReynolds; public administration expert Leonard D. White; Sears, Roebuck executive and U.S. General Robert E. Wood; and electrical engineer and Cooper Union President Gano Dunn. All eight committee members approved the report by signing on a sheet, bound in after the free front endpapers. Near Fine. Minor rubbing to corners. Presentation copy in contemporary burgundy morocco gilt.